Welcome to the Only Get Rich Once Blog! 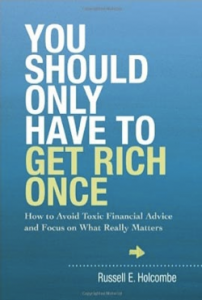 My new book, You Should Only Have to Get Rich Once, was written as a common sense tool for wealthy clients. Give us a call today and get one step closer to finding your Point of Independence. Don't forget that You Should Only Have To Get Rich Once! Holcombe Financial delivers a creative financial planning process to clients ready to think differently about their wealth. Our clients count on us to expose the issues really bothering them (even if they have a tough time saying it). We anticipate the challenges they might encounter, and develop innovative solutions to maintain their Independence forever.